Many dairy farmers believe that low milk prices are the biggest danger to their livelihoods. For more than a few, the thought is that the best solution would be a Canadian-style supply management program to boost milk prices and keep them at profitable levels. I don’t buy all of the arguments for quotas and such, and there is no reason to believe that our elected representatives will ever enact anything approaching Canada’s system. And as much as they are hurting you (and Graze), low milk prices are not the problem. Instead they are a major symptom of a much greater problem that is creating a host of other symptoms which, over the long run, are even more damaging than low milk prices. The real problems lie with the reality that mainstream agriculture is no longer firmly grounded in natural biology, and that the “culture” part of the word is completely subsumed by a hyper-business mentality that has spawned consolidation of corporate power from retail shelf all the way down to the top few inches of our soils. And this reality is just about as true within USDA-anointed organic as it is in mainstream conventional agriculture. In other words, any effort to hike milk prices is doomed to failure if it does not address the larger biological and cultural problems. For instance, the new Farm Bill offers little more than perhaps the slightest delay in the inevitable trend of the big and powerful gobbling up the small and powerless. What to do? Some of you can largely escape this world and sell your way out of the problem, but most of the rest of us are not in a position to do this. And while changing production practices alone can certainly help, over the long run even the best grass farmers face a rigged game in terms of market access — one that needs major changes if small- and mid-scale farming is to be anything more than a low-paying hobby. Besides, the future of our country — and indeed the entire planet — depends upon our success in making the kinds of massive changes that will come too slowly without some help from society as a whole. One hundred percent of American agriculture needs to change — not just the 10% or 20% or whatever relatively small portion of the sector that seems possible within the foreseeable future if we rely only on current efforts to boost grassfed and other forms of regenerative agriculture. Our absolute fixation on “cheap food” is killing us. The negative environmental and social externalities that are not being accounted for in our modern agriculture will be our undoing. I know that some of you believe that ending all government involvement in agriculture would level the playing field and lead to a renaissance in the countryside. I don’t share that belief. Besides, Uncle Sam is never going to adopt a completely hands-off attitude when it comes to the nation’s food security, as starvation and revolution often go hand in hand. What I do believe is that a revolution in how our government regulates agriculture is in order. I certainly do not have all of the answers, but the changes outlined below might go a long way toward improving our food system from soil to dinner plate while providing opportunities for many more farmers to thrive. While I’ll emphasize dairy, much of this pertains to all of commercial agriculture. • Stop subsidizing commodity production, and start putting the vast bulk of incentives toward ensuring the long-term viability of our soils. The details here are complex, but the concept is simple. Payments are made on a sliding scale in which permanent sods under best management practices receive the greatest rewards, down to absolutely nothing in terms of support for continuous row cropping that leaves soil bare for months at a time. Make the payment spread so big that almost everyone will feel compelled to sign up for the program. While I’m not big on government fining farmers, transgressors — some of whom will refuse to participate in the new system — will be subject to severe penalties if they do not meet T limits that are based on reality rather than modeling. This policy shift would provide tremendous incentives for moving away from industrial agriculture, and toward something based more on natural biology. • Eliminate the federal alternative fuels blending requirement that plays a huge role in sending nearly half of our corn to ethanol plants, and provide no other incentives for producing the stuff at the federal level. When combined with the change described above, we’ve removed the vast majority of support for row-cropping — and the feedstuffs that factory livestock farms rely upon for their survival. Could eliminating the ethanol subsidies create lower grain prices? Over the long run that’s unlikely if the incentives for good soil stewardship are great enough. In any event, let’s see what the bigtime cash-croppers and factory farms can do under such a regime; let the chips fall where they may. And I’m not worried about starving, as today over half the corn crop is going into ethanol and ruminants that do not need anywhere near that amount of grain. Besides, American farmers have production in their genes, so they’ll figure out how to do their thing under the new rules. Average yields will climb, as only the most productive ground will be in row crops. • Reinvigorate the Land Grant universities and their extension activities by providing more public funding so that researchers and educators can help farmers adjust to this brave new world. Today most of our brightest agricultural minds are surviving by doing basic research that underpins the patented inventions of multinational conglomerates. I’ve known many a Land Grant researcher who wishes this wasn’t so. • Fund research into the carbon storage capabilities of soils under a wide variety of management strategies, and employ the findings in fine-tuning the new soil-based support regime. Like it or not, carbon is going to be the big deal among the consuming/taxpaying public, and eventually grass farmers are going to be rewarded for their ability to keep it out of the atmosphere. • Place strict limits on the amount of money that individual farming entities can receive from government. In other words, get rid of the current loopholes. By the way, there will be little need for crop insurance, as the soil resilience provided by biologically based farming practices will forestall disaster in all but the worst weather events. Any disaster payments might come with strings attached, such as a requirement that production practices be moved into the upper tiers of the new program. Plus, under this program fewer marginal acres would be cropped, thus reducing the scale of the disaster problems. • Soil conservation agencies would have very limited dollars available to fund structures. The vast majority of their efforts would be directed toward improving soil health. • Form mechanisms for funding public research and demonstration farms that provide information to producers in specific locales. The changes we’re discussing here are moving us away from generic, prescription-based agriculture, and toward localized solutions. Grants could provide much of the funding, and producers could choose to direct to these efforts some of the checkoff money they currently pay for ineffective promotion programs. • In dairy, we should change the federal milk marketing orders and associated payment schemes to eliminate all payments based on water, while installing small deductions for non-solids volumes. Milk checks should be based on actual solids marketed, with the greatest emphasis placed on the fat component. Do this, and you’d alter the equation a bit (or maybe quite a bit) in terms of what kinds of dairy operations are most “efficient”. While this may not make sense in markets where fluid sales are king, I do not believe that consumers are buying milk because they like paying for the water therein. Besides, fluid sales are dropping so fast that pretty soon we’ll be down near the utilization territory seen in New Zealand, where the milk buyers have been penalizing water production for many decades. Hauling charges might decline, too. And in this case we’re also talking about international hauling, as New Zealand has been sending boatloads of butter to the U.S. to meet our growing demand. This is ridiculous given our current milk “surplus” problems. 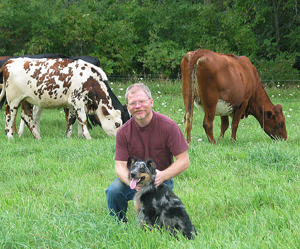 • Take raw milk regulation out of the hands of individual states and allow interstate sales. In return, raw milk purveyors must accept — and pay for — stringent regulation that includes frequent inspections to provide some assurance of the health safety of the non-pasteurized product. The regulations would toughen as the size and marketing scale of the enterprise grows. Also, raw milk buyers need to know the health safety risks, although that information should not come from FDA/CDC/mainstream industry scare tactics. • There should be a major restructuring of our government’s food pyramid to recognize the importance of healthy fats and meats. You and I know that all meats and milks are not the same, so as time goes on, further tweaking of the pyramid will be needed to provide the clearest possible messaging. • Any foods imported must be produced under the new U.S. standards and without the aid of commodity-based subsidies that artificially lower their prices. • The ultimate goal of this new system is returning more independent farmers to the land. To do that we’ll need training programs jointly funded by government and industry. Creative, government-backed financing of start-ups will of course be needed. • Speaking of which, government regulation of small-scale processing and marketing efforts must change, and creative financing packages backed by those same governments will be needed. Grants for business planning and education will need to be plentiful, and regulations must be retooled to accommodate small scales and limited distribution areas. Regulators have become de-facto partners of the mega-processors/marketers; meanwhile, they turn up the heat on the little guys. This has to change if our politicians are actually going do something to boost rural communities. • Antitrust enforcement needs to ramp up, although in reality it will be more difficult for the Tysons, JBSs and Bayer/Monsantos to dominate the world I’ve described. Free enterprise might stand a chance of being free. I’ve likely missed a couple of important elements here, and don’t be shy about pointing them out to me. And certainly most of the above is a daydream, especially as I write this with a goodly share of the federal government shuttered. It is easy enough to feel hopeless in times like these, and think that the only possible solution is to install supply management. But that won’t solve the problem. Something that included much of the above just might. I am not thinking that such a dream will become reality in my lifetime. In the meantime, I’ll continue to hold out hope that we, both individually and in groups, can get past our current situation and eventually achieve a better future. 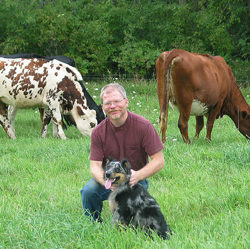 In addition to publishing Graze, Joel McNair grazes dairy heifers on a small farm in southern Wisconsin.